Toronto is the most diverse city in the world. In the last 40 years the visible minority population has grown from 13% to almost 50% and is expected to become the majority in 2017. It is also interesting that the minority is not dominated by any one race or culture but distributed between multiple cultures from Jamaica to South Asia. The numbers might tell a story but stepping onto the streets of Toronto emphasizes it emphatically. At the end of our trip we couldn’t recall if people spoke English in Toronto or not. Our trip began with an expensive taxi ride from the Toronto Pearson International Airport to our hotel, the Hilton Garden Inn, Downtown Toronto. On average the one-way prices for a taxi into the city is $60. Often traveling with children and grandparents, we find it ideal to stay in a hotel that is walking distance from the key sites, is large enough to handle the needs of a large family and yet sophisticated enough to make it feel like a vacation. We save the quaint boutique hotels and the luxury hotels that you might wake up in if you were writing 3 Perfect Days for United, for anniversary trips. The hotel was a 10 minute walk from the CN Tower, the aquarium and the lake. With a few hours still left to sundown, we headed to the one attraction that one normally doesn’t associate with a modern American city, a castle! 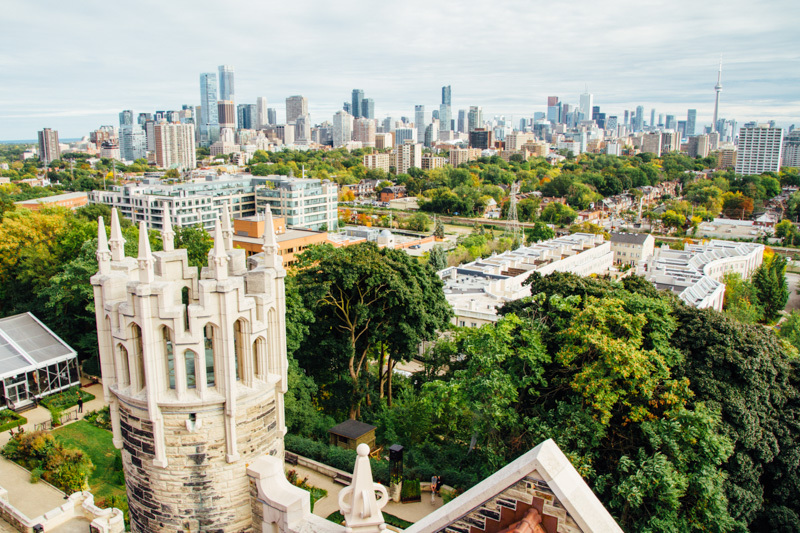 Casa Loma is the former home of Canadian financier Sir Henry Pellatt and offers one of the grandest views of the city. The three best ways to quickly orient yourself to a city as a tourist is to find a vantage point above the city, take a cruise on a water body through it, and complete a full hop on – hop off ride without hoping on and off. The castle is complete with towers, tunnels, gardens and the required opulent suites. It offers a wonderful view into aristocratic life in the early 20th century in Canada. From Casa Loma, we decided to head back downtown to complete our view of Toronto from the sky with a ride to the top of CN Tower. The signature of Toronto, dominating the skyline, it is the tallest free-standing structure in the Western Hemisphere. The wait to the top is dependent on the wind conditions, so call ahead to find out. If your trip includes 3 or more attractions in Toronto consider buying the City Pass a great discount package. We just missed the sunset and the twilight due to the wait, but still managed to get the night view of a city that reminded us of Chicago across the lakes and the border. Lake Ontario bounds Toronto on the south, but the city stretches itself widely in the other directions to accommodate the 2.6 million residents. The glass floor is not for the faint hearted, and the Edge Walk on the exterior of the tower, is truly only for the those interested in letting their head spin and heart race. We had dinner at the restaurant on top but didn’t have too many vegetarian choices. With the kids asleep in the grandparents room, we decided to head out to Bar Chef, rated by Food and Wine Magazine as one of the “top seven new and innovative bars in the world”. Co-owner Frankie Solarik is a pioneer of the Modernist and contemporary approach to cocktails and we felt less in a bar and more in a gallery as our drinks came out and explained to us. We had the Daiquiri Adaptation, a blend of tropical citrus juices and a creamy nuttiness found in classic Tiki-style cocktails that came inside a coconut along with a flavor packed, alcohol soaked bowl of fruits, herbs and nuts and the Day to Evening cocktail which came with bed of jello that had little herbs growing in them with flavors that you would taste in the morning to the night. A definite must visit in Toronto. Day 2: Our first trip to Toronto, we had a toss up between spending more time in Toronto versus making a day trip out to Niagara. Having heard from practically everyone that the view is way better from the Canadian side we decided to board a guided bus tour to Niagara. Niagara Falls is 2 hours from Toronto and our guide Alex, is one of the best that we’ve come across. Apart from the usual, pointing out the highlights, he was comfortable enough to speak about his personal experiences as a Canadian from healthcare, to daily expenses to property rates. By the time we caught our first glimpse of the thundering falls, we had heard enough to make our own well-informed decisions on if the grass is greener on the other side. Niagara falls is the collection of 3 waterfalls, the American, Bridal Veil and Horseshoe, on the Niagara River, that empties Lake Erie into Lake Ontario. Combined the falls is the largest in the world in terms of flow rate. At peak volume, over 225,000 cubic feet of water flows over the cliff per second, approximately 2.5 Olympic Swimming pools of water flowing over per second. It’s been centuries since American aristocrat Theodosia Burr, daughter of the future U.S. Vice-President, Auron Burr embarked on a ,”Bridal tour” to Niagara Falls and Jerome Bonaparte (younger brother of Napoleon) and his Baltimore bride Elizabeth Patterson made their trek in 1804, but the Niagara falls moniker as the Honeymoon Capital of the World seems to have stuck though it is hard to imagine finding a quiet moment or space to even steal a kiss these days. It is however one of the grandest wonders of the world and a must see. On the Canadian side, Hornblower Cruises have the contract for the boat ride into the falls and it is 20 minutes well spent. The Skylon Tower offers views from above, Journey Behind the Falls, offers views from behind and a newly opened Zip-line offers views in blur. Our day tour took us to Niagara-on-the-Lake a charming town at the intersection of Niagara River and Lake Ontario and we spent an hour watching as the two met at Queen’s Royal Park and then relished it with ice cream from Cow’s. Our tour also took us to Niagara College Teaching Winery, where we got our first taste of Canadian Ice Wine. We bought Ice Syrup, Ice Wine and chocolates dipped in both for our home. The ride back to Toronto was long, but fortuitous because we learnt that it was the night of Nuit Blanche in Toronto. Their website says Nuit Blanche Toronto is a free, annual, city-wide celebration of contemporary art, produced by the City of Toronto in collaboration with Toronto’s arts community. For one sleepless night, from sunset to sunrise, the familiar is discarded and Toronto is transformed into an artistic playground for a series of exhilarating contemporary art experiences in unexpected public spaces. Again, thanking our parents for watching the kids, we decided to brave and indulge the night. We saw street magicians, rap artists, noir-films, modern art installations, dancing fountains with a movie projected on its spray and then danced half the night away ourselves to lasers and a DJ on a blocked off street. We were one of hundreds of thousands of people from every age, race and background and yet we were all one together. It was awesome! Day 3: Remember the minimum 3 attractions that one must see to benefit from the city pass, and if you are keeping score, we’d only crossed off two. So we headed to Ripley’s Aquarium of Canada, and over 2 hours ensured that our kids had something to remember this trip by. From starfish, to jellyfish, to shellfish, to sharks. From kelp, to Anemones to coral. Aquariums have that rare quality of being able to make anyone into a child, and we soon realized that it wasn’t just for the kids but by the time we were done, we had, once again, been drowned by the vastness of a world that is actually most of the earth. If you know us, then you also know, we are overachievers, so to make complete “paisa vasool” of our City Pass, we headed to the Royal Ontario Museum, and dedicated the 2 hours we had to the Dinosaur exhibit. We felt dwarfed by Gordo, the enormous Barosauraus or frightened by the extinct but living in our nightmares T-Rex, and ended our trip to Toronto on a educational note, understanding the Age of Dinosaurs. Toronto, as we learnt, pronounced Torono (only Tourists pronounce the T) is one of the coolest cities in the world. We have only gotten a glimpse and tasted even less of the famed cuisine, and that only makes it easier to pack our bags and cross the border and be in Toronto, next time the travel bug bites us. Previous Go find your park; your heart, your mind and your soul will thank you for it.